"My charge is to strengthen and grow graduate programs," said Kletzer. "My role will be to work side by side with the academic departments to help them grow their current programs and think about new programs they want to develop." Kletzer, a professor of economics who joined the UC Santa Cruz faculty in 1992, is stepping into this key leadership position following seven years as provost of Colby College. Returning to campus, she is eager to lead the "centrally important task" of graduate education. Kletzer, a labor economist who specializes in the labor market consequences of international trade and technological change, says this opportunity is a good fit for "my history and UC Santa Cruz's history." The Graduate Division is better integrated into the campus than ever before, and growth will enhance the UC Santa Cruz mission of teaching and research, boost the campus's reputation, and prepare graduates to assume leadership opportunities in the 21st century economy. "When I arrived in 1992, UC Santa Cruz was very much an undergraduate campus, even though we had graduate programs," said Kletzer. "We had a really strong reputation—deservedly—as an undergraduate institution. Over the last 26 years, we have embraced the value of graduate programs." Strong graduate programs enhance undergraduate education in multiple ways, said Kletzer, who sees them as complementary rather than competing interests. "Our doctoral students and postdoctoral scholars enhance the teaching environment, they help provide research mentorship to undergraduates, and they are role models for our undergraduates," she said. "They enrich the research environment and raise our research reputation, which attracts undergraduates and enhances the value of their degree after they graduate. Graduate programs make a direct, positive impact on undergraduates. It's not a trade-off." The campus currently faces a mandate to grow its doctoral program enrollment to 12 percent of undergraduate enrollment—a goal linked to "rebenching," the UC Office of the President initiative to redress past inequities in per-student state funding at some UC campuses that also provided funds to UC Santa Cruz to increase doctoral enrollments. Calling that target a "really steep path to climb" from current enrollment levels of just under 8 percent, Kletzer said she is eager to work with faculty in departments and through the Academic Senate to support realistic growth. "As provost at Colby, many of my academic program accomplishments came about through collaboration," she said, mentioning the launch of an enhanced major in computational biology that involved the computer science and biology departments, together with the establishment of a partnership with a research laboratory located in Maine. "As provost, I wasn't going to tell my faculty how to design the curriculum. I know my colleagues bring the intellectual firepower," she said. "But academic departments won't launch programs without a commitment from the center." That commitment can take the form of additional faculty resources, expanded fellowships, support for teaching assistants and graduate student research assistance, and market research, noted Kletzer, adding, "Each side knows what the other can bring. We are stronger together." Kletzer credits her predecessor, Vice Provost and Dean of Graduate Studies Tyrus Miller, with bringing the division "out from the shadows." "The division is much more integrated with the academic divisions, and it's much more visible to the departments and central campus than it was five years ago," she said. "Tyrus thought hard about how to use resources, and the division is much stronger for his leadership." Chancellor George Blumenthal and Campus Provost/Executive Vice Chancellor Marlene Tromp are “fully committed” to the importance of growing doctoral education and they are "mindful of what any campus initiative means for graduate programs," noted Kletzer. 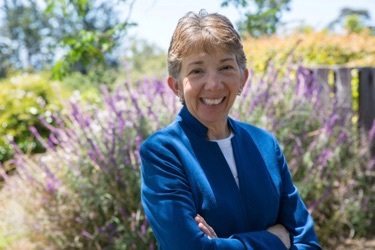 Masters program enrollments, which Kletzer said make a "serious contribution to California's workforce needs," are in good shape, having grown 14 percent during the past five years. "Increasingly, undergraduates think about getting an advanced degree, and master's degrees are the most common," she said. Doctoral education, however, is a changing and challenging landscape. Once exclusively dedicated to producing tenure-track faculty, doctoral programs today need to prepare graduates for a range of nonacademic jobs, said Kletzer. "Across the country today, more than 50 percent of all college and university faculty positions are nontenured," said Kletzer. "That's really different than when I went to graduate school 38 years ago. This has been changing over the last 20 years—first in humanities, but it has changed now across the disciplines. We need to be willing to see it for what it is and broaden our view of labor-market outcomes for our graduates." To adapt, graduate programs may need to rethink their curriculum, their advising and mentoring efforts, and their expectations about how long it takes to earn a doctorate, said Kletzer. "The future of graduate education, especially at the doctoral level, is going to lead to many more nonacademic careers," she said, which means it will be important to increase support for nonacademic jobs. "I want to work with faculty so they recognize the validity of diverse career paths," she said. "I worry that we prioritize tenure-track academic jobs and there's some stigma attached to nonacademic jobs. The skills and training we provide doctoral students can be used broadly across the labor market." Kletzer is eager to bring diverse voices to the table, to learn what other institutions are doing, and to get her hands on national data about where Ph.D. holders are getting jobs. "Those data are decentralized, so it's tough to understand the landscape," she said. "As a labor economist, it's an incredibly interesting problem." Which brings Kletzer back to the appeal of her new job. "I took on the Colby provostship because it was an attractive leadership opportunity," she said. "I wanted to strengthen academic programs, build teaching and research partnerships, and support faculty. With those goals met, I was eager to get back to our more research-intensive environment and make a contribution here. Building our graduate programs requires leadership and collaboration. That's a combination that really suits me."